The nicest season is coming and we’re ready, we already had some sunbeams in Western Europe! The sun makes you happy, certainly after these cold dark winter days…. Enjoy the sun to the full! After a couple of years we can speak of a small revival on economic matters, even it is just frail, the unemployment figures are decreasing as well as the figures of poverty. As we say it is still frail and fragile, but is always better something than nothing at all… Let’s hope the tendency will continue. A strong economy is always a good thing for our niche market. At the end of June we’ll have our huge open house, bigger than ever. Followed the next day by our famous convoy to the Vintage meeting of Hessisch Oldendorf in Germany. You’re all welcome, of course. All information can be found here. The week after there will be the greatest VW nostalgia meeting that you can imagine with the European Bug In at Chimay (yes, the town of the famous trappist beer) and we’ll be present there too. the perfect bumper, with the perfect fit, the perfect pressing (with the right raising line in it) and in an OUTSTANDING chrome quality!!! 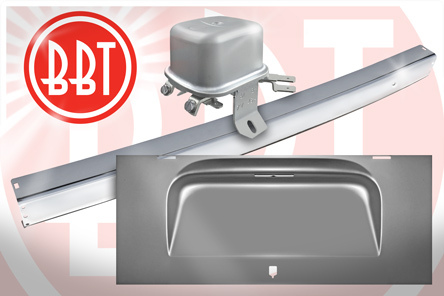 Nothing beats the quality of OUR BBT bumpers, tell them BBT Bob told you! So now we offer you the perfect solution to replace that old scruffy, bend or rusted out original engine lid with this perfect fit extreme high standard replacement part for a perfect fit and finish. As all BBT privately manufactured sheet metal also this engine lid is finished in a weld through silver primer. Look for the small BBT quality sticker to ensure you bought the real deal! Keep the sun out of your beloved car and give your car that smooth fifties/sixties look! After the immense popularity of the louvres for Beetles, we decided to team up and bring these for the Type 3 owners as well! Fully adjustable guarantees a perfect fit! We already had these clips in beige color (BBT 0409-656) Now we offer the full color range. So all stock applications color wise are just a few mouse clicks away from your doorstep from now on. Our mounting cups fit as standard parts, exactly as original, sold each. now available readily from our stocks! replace that old scruffy corner now with this brand new super fit , standard as stock quality part from a known manufacturer! Oil lines in pre cut lengths of 1 meter. These are remarkably cheaper as the cut to order lengths! Available only as long as stocks lasts! Early flywheel shims are different from later ones, actually there are three different flywheel shims, the very early (25 and 30 DIN Hp or 36SAE as you want to call it) after comes what we call the 6 volts, for cars originally made between 1960 and 1966 and the later 12 Volt models. Flywheels shims are multi important to adjust the end play (or axial play in regards to your bearing to name it technically correct) on your crankshaft. This end play always has to be between 0,10 and 0,15mm. After more than ten years of searching were very happy to add these early flywheel shims to our product line, so you can assemble that early engine of yours back again like it should! Finally an affordable good quality solution to your tired Type 4 engine. Support Mahle, support quality. Finally we have a good quality push rod added to our stocks. This push rod is made by a long time manufacturer with very keen eye to detail for quality and fitting. The correct hardness of the push rod ends is the major trick here! We've visited in person the factory, which makes these push rods and we are impressed with the operation. So replacing your push rods has never been that easy since long time ago! The same manufacturer as the sliding door central lock delivered us also this state of the art sliding door outside latch. This latch suffers many times from bad chrome. You never can re-chrome your old one for the price we sell the new one. This is a fairly inexpensive top product to exact factory standards, get yours now! replace that old scruffy (or lost) pin with our top quality reproductions!